The beautiful Bellingrath Gardens and Home is located in Mobile, Alabama. Visitors flock to this tourist attraction each year to view acre upon acre of blooming flowers. No matter what time of year you visit, you won't be disappointed. Flowers are blooming here year 'round! In this interview, LoveToKnow Garden spoke with Leslie C. Schraeder, Director of Marketing and Public Relations, who provides information on the estate garden and home. Chuck Owen, Horticulturist as well as the Nursery and Maintenance Manager at Bellingrath, provides expert information on growing azaleas. How many acres of flowers will be in bloom during the spring? Bellingrath Gardens and Home is a 65-acre estate garden that blooms in full color year round. Spring is one of the highlights at Bellingrath each year. In early spring, the gardens are filled with azaleas, hydrangeas, Easter lilies, pansies, tulips, snapdragons, impatiens, petunias, violas, salvia, marigolds and dianthus. Later in the season, the garden features delphiniums, fuchsia, geraniums, Mexican Heather and begonias. What are the must-see areas in Bellingrath Gardens? In addition to the shades of pink, red, purple and white that guests will see as they wander the 2 miles of winding pathways lined with blooming azaleas, there are some must-see areas. The Mirror Lake Overlook is one of the most picturesque spots in the Gardens. Guests can look back across the open expanse of Mirror Lake reflecting the bright blue sky and framed by dark pink azalea blooms. For more than 75 years, one of the most photographed areas within Bellingrath Gardens has been its Rockery. The Rockery, designed by Mrs. Bessie Morse Bellingrath, is a series of flagstone steps with small terraces, waterfalls and pools that descends between an elaborately built rock garden. During April, Bellingrath's award-winning Rose Garden has its first blush. The Rose Garden bears the design of the Mobile Rotary Club pin and features 2,000 roses in over 75 varieties. Looking out over Fowl River, the Grotto is another must see area at Bellingrath. George B. Rogers, the Bellingrath's architect, created fountains, pools and waterfalls to solve the problem of the artesian wells that ran throughout the Gardens. The Grotto was the first water feature completed and is one of the most recognizable areas in the Gardens. What varieties of Azaleas will visitors get to see at Bellingrath Gardens? The majority of the azaleas at Bellingrath are Southern Indica varieties. The varieties include: 'Formosa', 'Daphne Salmon', 'Southern Charm', 'Pride of Mobile', 'G.G. Gerbing', 'George Lindley Tabor', and 'Christmas Cheer'. Are there any special activities planned during Azaleas exhibit? Azalea Bloom Out! Usually the second or third week of March depending on the winter weather conditions - March 21 to March 29, 2009. Guest will enjoy the blooms of more than 250,000 vibrant azaleas in an explosion of color throughout the 65 acres of Bellingrath Gardens. The Mobile Azalea Trail Maids, ambassadors for Mobile dressed in custom made antebellum gowns, will be in the gardens on March 21, 22, 28 and 29th. They will greet guests and be available for photographs. See hundreds of classic and vintage automobiles from the Model T to the Firebird displayed on Bellingrath's Great Lawn. Sponsored by the Mobile Bay Mustang Club, enjoy live entertainment throughout the day. Grab the kids and come out to our annual Easter Egg Hunt. There will be special hunts for toddlers and older kids as well as prizes, candy, activities and pictures with the Easter Bunny. Start your Easter Sunday on The Great Lawn with our Easter Sunrise Service. The service will be led by Dr. Gorman Houston from Dauphin Way United Methodist Church. Bring your best rose blooms and enter them in the show. Enjoy the award-winning blooms and arrangements on display. Learn how to grow and care for roses from area experts. Rose plants, supplies, books and gifts will be on sale in the Bellingrath Gift Shop. Where do azaleas prefer to be planted? Azaleas prefer to be planted in light, filtered shade but can tolerate more sun if properly maintained. An organic, well drained, acidic (pH 4.5 to 6.0) soil is a must. Proper air circulation in your planting location should also be considered to help control disease. 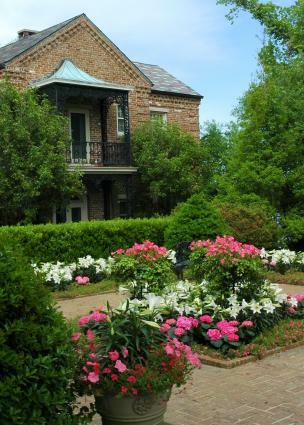 In a garden as large as Bellingrath, we have azaleas planted in many different locations. Some are in full sun, some receive morning sun and some get afternoon sun, while others are growing in areas that receive little direct sunlight. Again, proper care and maintenance are the key. The nutrient requirements of azaleas are low when compared to other landscape plants. In fact, azaleas are easily damaged by high levels of fertilizer. Taking an annual soil test is the only way to determine the proper quantity to apply. To maintain healthy plants, proper levels of the three major nutrients, nitrogen, phosphorus, and potassium are important, as well as iron and calcium. It is best to divide the recommended rates of fertilizer into three or four monthly applications starting in early spring. When should azaleas be pruned? Azaleas should "almost" never be pruned except to remove dead or damaged wood. It is important to know the mature size of the plants you are considering to plant in your landscape. Let the plants grow to fit the space instead of trying to prune the plant to fit. If you do have to prune an azalea, prune it just after it blooms before the buds for the next year are set. Here at Bellingrath, however, we are in the middle of a multi-year rejuvenation pruning project. Each year a different section of azaleas is pruned down to about 18". Because the plants have a large established root system they re-grow back to their mature height in about three years. What is the best kind of mulch for azaleas? There are a number of good organic materials that make good mulches. Pine straw, ground pine or cypress bark and ground leaves from hardwoods all make good mulches. The important part about mulching is just doing it. Mulch helps to conserve soil moisture, aids in keeping weeds down, helps control soil erosion and reduces rain runoff. Are azaleas susceptible to any particular insects? Azaleas are relatively pest-free when compared to other landscape plants. However, there are several pests that can cause damage. The most common pests that we see are lace bugs, caterpillars, and spider mites. Deer also feed on azaleas, especially during the winter months. If an azalea plant gets frost damage, can it be saved? It is important to select plants that will grow well in your area. Make sure that they are recommended for your hardiness zone. Azaleas can suffer cold damage, usually from a late frost after flower buds have started to mature or to new growth. For the most part, most of this type of damage has little long-lasting impact to healthy, mature plants. If you'd like to learn more about Bellingrath Gardens and Home, please visit their website. They'll provide you with driving directions, information on available tours and where to stay while you're visiting. Bellingrath Gardens is wheelchair accessible, and they may be rented on the premises. Can't visit the gardens in person? Check out our slideshow of Bellingrath Gardens!